If you’re looking for a healthy but delicious snack for your senior loved one’s meals this summer, you might consider peaches. These fruits are not only delicious but contain numerous health benefits. They’re only 35-50 calories a fruit and contain no fat making them a healthy choice. Peaches are also rich in phenols, which are chemicals that act as antioxidants that help reduce obesity-related diabetes and cardiovascular disease. Peaches are also packed with vitamins A and C, which can help regenerate skin tissue and keep skin healthy. Oshkosh senior care providers might consider using some of the following recipes to round out senior diets. Don’t be afraid to slice up some peaches and have your senior loved one try them with cream, yogurt, or even cottage cheese. This option works best if you can find fresh peaches from a local farmer’s market as these are often the tastiest to eat as plain fruit. Consider adding a little bit of raw, local honey or a sweetener like Splenda if the peaches are a bit tart. If you’re looking for a delicious and healthy way to serve peaches, a smoothie might be the way to go. Combine one cup of freshly sliced peaches, peach or plain flavored Greek yogurt and protein powder, one cup of milk, and 10-12 crescent ice cubes. Once all the ingredients are together, blend them thoroughly. Be sure to put the ice toward the bottom of the blender and the softer ingredients toward the top. Blend the mixture and serve right away. Season the pork with salt and pepper and grill it on a skillet for about ten minutes on each side. Combine three wedged peaches, ½-cup dry white wine, 1/3-cup light brown sugar, and half a cup of water in a saucepan. Next, add strips of lemon zest to the pan and squeeze in lemon juice. Cover this mixture and cook it over medium-high heat for five to seven minutes. Transfer the peaches to a bowl, but leave the juice in the pan. Add two teaspoons of whole-grain mustard, ½ teaspoon of salt, and ¼ teaspoon of pepper to the juices in the pan. Transfer 1/3 cup of liquid to a small bowl and stir in ¼ teaspoon of chopped rosemary. Take the rosemary liquid and brush it onto the pork, which you should continue grilling until it reaches 145 degrees Fahrenheit. While waiting for the meat to finish grilling, simmer the remaining liquid in the saucepan until it gets syrupy. When this happens, return the peaches into the syrup. Slice the pork and cover each slice with a generous helping of the peaches. Prepare a grill with nonstick spray and cook five slices of bacon in a skillet. Once it’s crisp, remove it and put it on a plate with paper towels. Saute one finely chopped shallot in the bacon grease for added flavor. Stir in one teaspoon of Dijon mustard, ¼-cup balsamic vinegar and one-teaspoon sugar. Add salt and pepper to taste. Next, quarter three large peaches. Brush each side with olive oil and season it with pepper and salt, then grill it for about one to two minutes on each side. Add spinach, sliced red onions, and any other desired greens to a large serving bowl. Add the peaches, the vinaigrette and the chopped bacon and toss it all together. If your senior loved one is a pancake fan, try this take on a sweet classic. In a non-stick bowl, pour two cups of Bisquick mix, two tablespoons of sugar, two teaspoons of baking powder, ½ teaspoon of ground cinnamon, 1½ cups of buttermilk and one egg. 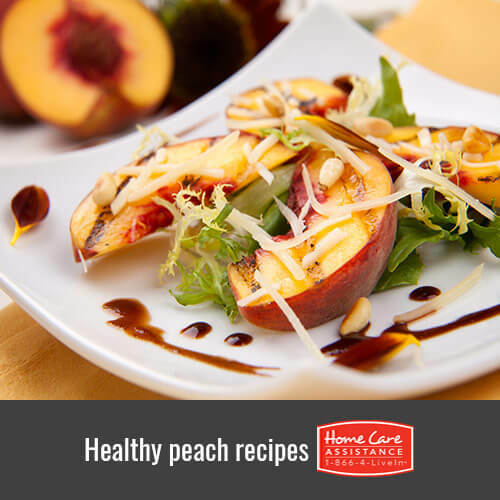 Whisk the mixture until it is blended well before gently folding in 1½ cup of finely chopped fresh peaches. Heat a skillet to 375 degrees and grease with nonstick spray or vegetable oil. Use a ¼-measuring cup to dole out small pancakes. You will know they are ready to flip when the top of each pancake is covered with many bubbles. Cook until each side is lightly browned. For added fun, serve the pancakes with whipped cream, extra sliced peaches, and a little pinch of cinnamon. Help your senior loved one maintain a well-balanced diet with these and other beneficial fruits. If your loved one is having trouble preparing meals alone, turn to Home Care Assistance of Oshkosh. We provide comprehensive live-in, hourly, and Oshkosh respite care to give seniors the tools they need to adopt healthy lifestyle habits including physical exercise and nutritious diet. Call (920) 710-2273 today to set up a care plan with an experienced Care Manager today.